What to cook when your house burns. – Carbs & Fiber. What to cook when your house burns. On Friday morning, our house went on fire. First and most important, we’re all okay, even our little dog, who was home alone when the fire broke out (poor, sweet baby). And 99% of our belongings are fine too. We rent, so the structural damage—which is not inconsiderable—is a secondary concern for us, and it’s being handled by our landlord. The house is habitable, with all the interior damage having been done by the fire department in an effort to pinpoint where the fire had started. We’ve cleaned up that mess and are dealing with the other inconveniences the best we can. Without going into the whole play-by-play, the gist of it is that our neighbor heard the telltale popping noises of an electrical fire and called 911 right away, thereby saving the house, all of its contents and our dog. It’s been easy to have ugly thoughts about what could have happened, as you might imagine. On Friday night, once the debris was cleared and our door locks were replaced (a fireman having come through them with an axe), we were a bit…at loose ends. We felt as though we should have been doing something, but all the necessary cleanup had already been done. 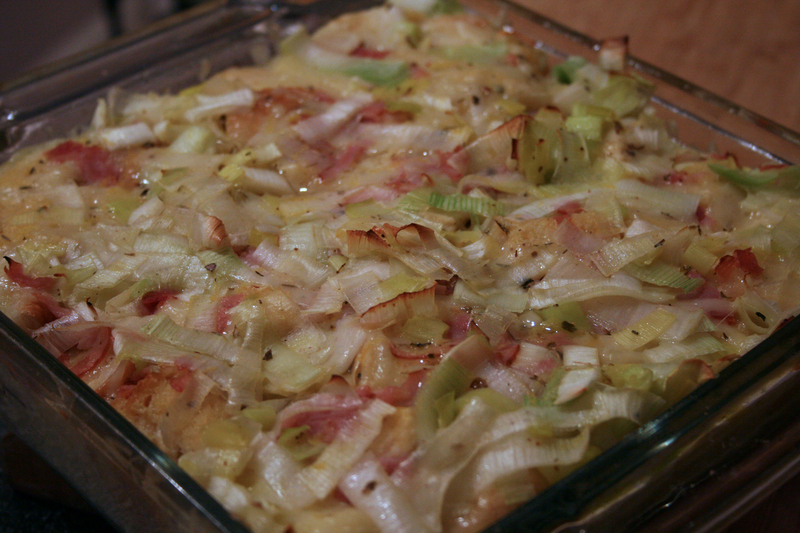 So I made dinner as usual—a savory leek and Swiss bread pudding. It sounds dumb but doing something like cooking let me focus on a rote task—chop leeks, cube bread, grate cheese, sweat leeks, etc—for a while. All thoughts of fire and kitchen destruction and my poor scared dog (GAH I cannot even think of how terrified he must have been when the firemen broke down the door) got pushed to the side for a little while. I liked the finished result well enough but I did have a few issues. One, I’m not sure if I didn’t sweat the leeks long enough or what, but they were tougher than I would have liked. Had I known that I would have used an onion instead. Also, while the recipe called for a baking time of 25-30 minutes, I actually left this in closer to 50 minutes because it was still very runny after 30. The recipe says the pudding is done when you pull the bread away from the sides of the baking dish and don’t see liquid…that was the case when I checked after 30 minutes but the bottom and middle of the pudding were still fairly gloppy. This was a Fresh 20 recipe and one of the rare semi-fails. In the few (very few) cases where I’ve had problems with a Fresh 20 recipe it has always been related to cooking time, always. I think the problem is simply my oven, although I will say that Fresh 20 seems to have a blind spot when it comes to how long it is appropriate to adequately cook a potato. This only requires a minor adjustment to fix, of course, but someone who isn’t comfortable in the kitchen may be very disappointed in their results initially! Finally, this was fine for dinner but I think it would be much better for a brunch. Instead of ham and Swiss you could use crumbled sausage or bacon and any other kind of cheese that melts well. Or skip the meat altogether and make a vegetarian-friendly version with onion, red pepper, mushrooms, spinach or whatever. Preheat oven to 350 degrees. Prepare an 8×8 inch brownie pan by lightly brushing with olive oil. Heat a large, nonstick sauté pan over medium heat; add in oil and then leeks. Sweat the leeks for 2 minutes until they are soft and translucent. Sprinkle with salt & pepper. In a large mixing bowl, whisk to combine the eggs, milk, herbs lemon zest, and salt & pepper – set aside. Arrange the bread evenly in prepared pan and sprinkle with cheese, cooked leeks, and ham (optional). Pour egg mixture over the top and then push the bread down into the liquid with a spatula so the eggs and milk absorb into the bread. Place into the preheated oven and cook for 20 -25 minutes or until no liquid remains when you pull the bread away from the side of the pan with a knife. Cool slightly and serve warm. Makes 6 servings. I’m sorry to hear about your home! That is indeed terrifying 😦 But at least everyone is safe and sound. The safety of you and your loved ones is truly what’s most important. Thank you! Yes, we were very lucky indeed.